Hurricane Hugo caused 34 fatalities (most by electrocution or drowning) in the Caribbean and 27 in South Carolina, left nearly 100,000 homeless, and resulted in $10 billion (1989 USD) in damage overall, making it the most damaging hurricane ever recorded at the time. Of this total, $7 billion was from the United States and Puerto Rico, ranking it as the costliest storm to impact the country at the time. Since 1989, however, it has been surpassed by multiple storms and now ranks as the eleventh costliest in the United States. Hurricane Hugo originated as a tropical wave (which also spawned Hurricane Raymond), which moved off the west coast of Africa on September 9. Soon after moving off the African coast, it was classified as Tropical Depression Eleven southeast of the Cape Verde Islands. Winds were initially 30 mph (48 km/h) but they reached 35 mph (56 km/h) soon after. Moving on a steady westward track at 18 knots (21 mph, 33 k/h), Tropical Depression Eleven steadily intensified, becoming Tropical Storm Hugo on September 11 at 1800 UTC. On September 13, Hugo rapidly intensified, and reached hurricane strength 1265 miles (2035 km) east of the Leeward Islands. A low-pressure area to the south caused Hugo to gradually turn to the west-northwest, while the storm was slowly strengthening. 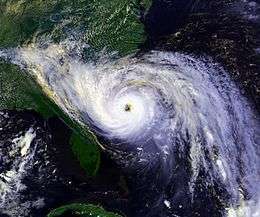 Shortly after, Hurricane Hugo began to rapidly intensify; 24 hours after it was classified as a hurricane, it had become a category 2 hurricane. After this bout of rapid strengthening, Hugo began to rapidly deepen, becoming a major hurricane early the next morning. After becoming a major hurricane, Hugo reached Category 4 strength, while moving slowly west-northwest. The hurricane briefly reached category 5 intensity on September 15 at 1800 UTC. Its maximum sustained winds had increased to 160 mph (260 km/h) and the minimum central pressure had dropped to 918 millibars (27.1 inHg). After peaking in intensity as a category 5 hurricane, Hugo weakened slightly to a category 4 hurricane. In the early hours of September 17, Hugo crossed in between Guadeloupe and Montserrat while its winds were near 140 mph (230 km/h), when hurricane-force winds extended only 45 mi (72 km) from the center. Less than 24 hours later, it made another landfall on the island of St. Croix, with the same intensity. That day, Hurricane Hugo also made landfalls in Puerto Rico, in Vieques and Fajardo, though it was slightly weaker. Hugo began to accelerate to the northwest soon after exiting eastern Puerto Rico. On September 18, the hurricane was located a couple of hundred miles east of Florida when it began a more northward track, in response to a steering flow associated with an upper-level low pressure area that was moving across the southeastern United States. Hugo then began to strengthen again, and it reached a secondary peak at 1800 UTC on September 21 as a Category 4 hurricane. The maximum sustained winds were 140 mph (230 km/h), while the minimum central pressure was 944 millibars (27.9 inHg). On September 22 at 0400 UTC, Hugo made landfall on Isle of Palms, South Carolina, at its secondary peak as a Category 4 hurricane on the Saffir–Simpson Hurricane Scale with 140-mph sustained winds and a central pressure of 934 millibars (27.6 inHg). The storm continued inland, and weakened to a Category 1 hurricane as the cloudy eye passed over Charlotte, North Carolina. Hugo continued on the weakening trend and weakened to a tropical storm later on the same day over central North Carolina. The storm continued weakening as it moved inland, and on September 23, the storm weakened to a remnant low. Its remnant low continued to accelerate north, and they reached the far northern Atlantic before dissipating on September 25. Late on September 15, the National Weather Service Office in San Juan, Puerto Rico issued a hurricane watch. On the following day, it was upgraded to a hurricane warning. In addition, the Civil Defense Office of Puerto Rico activated its Disaster Interagency Committee and began to evacuate coastal residents. Savannah was evacuated in anticipation of Hugo, but saw no effects of the storm other than isolated and light showers. Had Hugo hit Savannah, it would have been the first major hurricane to make landfall in Georgia since Hurricane Seven of the 1898 season. Governor Carroll Campbell of South Carolina ordered an evacuation of the South Carolina coast in advance of the storm. Hugo caused nearly $7 billion (1989 US$) in damage in the mainland United States and Puerto Rico. At the time it was the costliest hurricane in U.S. history, but was exceeded in 1992 by Hurricane Andrew, and by three other storms since then. It remains the sixth costliest hurricane in U.S. history. An additional $3 billion of damages was reported throughout the Caribbean. Therefore, total damages from the storm were near $10 billion (1989 US$). Sources differ on the number of people killed by Hugo, with some citing the American Meteorological Society's figure of 49, and others claiming 56 deaths. Severe damage was reported throughout the islands of the Caribbean. The storm caused an estimated $3 billion in damages in the Caribbean (including $1.8 billion in the USVI). The storm also took USVI television station WBNB-TV off the air by destroying their transmitter. At 1 am AST on September 17, 1989, Hurricane Hugo made a direct landfall on Grande-Terre in Guadeloupe, pounding the island with incredibly ferocious Category 4 sustained winds of 140 mph (220 km/h). A storm surge of up to eight ft (2.5 m) topped by high battering waves smashed ashore. Hugo wreaked massive devastation on the island, especially in Desirade and Grande-Terre. The hurricane damaged 30% of the buildings on the island and completely destroyed 10,000 homes (most of which were archaic houses), leaving a total of at least 90,000 or nearly 30% of the island's 340,000 people seriously affected, with 35,000 rendered homeless. 70% of the businesses sustained damages, including hotels, schools and churches. Five people died and 107 were injured. An additional seven people were killed three days after the storm, when a medical helicopter crashed while evacuating victims in Desirade. The storm almost completely destroyed (80%) the towns of le Moule and St. François, on the island's eastern end. Debris blocked at least 30% of the island's roads. Agriculture suffered massive losses that took years to recover from, as Hugo flattened 100% of the banana crop, 50% of the sugar cane crop and destroyed nearly all of the island's coconut palms. In addition, most of Guadeloupe's fishing fleet was wiped out. Total damage to the island from Hugo amounted to 4 billions francs or $880 million (1989 USD). Hugo's winds knocked the airport control tower out of commission; Raizet Airport anenometer experienced 90 mph (144 km/h) sustained winds as well as a 117 mph (187 km/h) sustained gust before failing. Minimal pressure fell to 943 mb (27.79 inHg) as the eye passed after midnight. In a French navy marine vessel in Pointe-à-Pitre bay, gusts reported to reach 184 mph (296 km/h). Hugo was the strongest storm to impact Guadeloupe since Hurricane Cleo (1964), and the worst storm since Hurricane Inez (1966). In addition it was the strongest hurricane to hit the island since the legendary 1899, the longest-lived Atlantic hurricane of all time and the 1928 storm. Strong winds from Hugo pounded the British Overseas Territory of Montserrat. Nearly every home on the island was damaged to some degree, leaving 11,000 out of 12,000 people, over 90% of the islands residents, homeless. Numerous schools, churches, the hospital, the police department, the government headquarters, and the main power station, disrupting electrical, water, and telephone service for weeks. A 180 feet (55 m) stone jetty was destroyed at Plymouth due to a storm surge of 20 feet (6.1 m). Inland, rainfall up to 7 inches (180 mm) created mudslides at the foot of Chances Peak, destroying 21 homes. Ten people were killed, 89 were injured, and damage reached at least $260 million, making it the most expensive hurricane in the history of Montserrat. Tourism and agriculture also suffered significantly. Additionally, the local bat population was devastated, with an estimated 90 percent decrease in numbers after Hugo's passage. The species Chiroderma improvisum has not been seen on Montserrat since, and it is feared that it may be extinct on the island. The slower speed allowed Hugo to punish the island of St. Croix with the worst beating of any location along the hurricane's destructive path. At 2 am local time on September 18, Hugo's eyewall struck St. Croix, bringing Category 4 winds, sustained at 140 mph (220 km/h). The hurricane's gusts were remarkably violent, and many residents witnessed tornado-like vortices barreling across the island as the hurricane raged about them. A storm surge of 2–3 ft (0.61–0.91 m), topped by battering waves 20–23 ft (6.1–7.0 m) high, assaulted the coast, adding to the destruction. Two people were killed on St. Croix, 80 injured, and 90% of the buildings were damaged or destroyed. Damage estimates for St. Croix were astronomical, over $1 billion, and the island's entire infrastructure was virtually wiped out. Six weeks after the hurricane, only 25% of the public roads had been cleared, and only 25% of the island had power." On the island of St. Thomas, the damage was bad but not nearly as extensive. Television station WBNB-TV channel 10 (the local CBS affiliate) had its transmitter completely destroyed by Hurricane Hugo. The station would not return to the air, because of the damages, and the owners' inability to afford repairs. Many business were destroyed. West Indies Transport had operated several businesses in Krum Bay, St. Thomas, including a dry dock, a ship repair facility, and a barge towing company. In UNITED STATES v. WEST INDIES TRANSPORT INC 96 7063 WIT 96 7064 96 7065 it was written that "Hurricane Hugo seriously damaged some of the barges, shifting them from their permitted positions. West Indies Transport did not attempt to repair, reposition, or salvage these barges after the storm. Instead, it used these barges as docks, repair facilities, and housing for employees in their new unauthorized locations." The company officers were charged and convicted of environmental and other crimes and ordered to pay restitution in excess of a million dollars to the U.S. in 1997. Damage in Puerto Rico was severe, especially in the eastern part of the island. The agricultural sector was devastated, with the banana and coffee crops being almost completely wiped out. Heavy rains caused severe flooding in the vicinity of San Juan; in addition, several roads and bridges were washed away. In all, 12 deaths in Puerto Rico are attributed to Hugo, six of which occurred in the southern city of Guayama where some residents were electrocuted by downed power lines. Nearly 28,000 people were left homeless by the storm as damages exceeded $1 billion. The storm caused $7 billion in damage in the United States, surpassing Hurricane Frederic of 1979 as the costliest tropical cyclone in that country. Hugo itself was surpassed by Hurricane Andrew in 1992 and several others over the next few decades. South Carolina suffered the worst impact, where Hugo made landfall as a Category 4 hurricane. In that state alone, 3,307 single family homes were destroyed, 18,171 were inflicted major damage, and 56,580 sustained minor impact, while more than 12,600 mobile homes and 18,000 multi–family houses were either damaged or destroyed. Losses reached at least $5.9 billion and there were thirty-five fatalities reported in South Carolina. There was also significant impact in North Carolina, where 205 structures were destroyed, 1,149 were severely damaged, and 2,638 suffered minor losses. One fatality occurred and damage in North Carolina reached about $1 billion. Impact in Florida was very minimal. The highest sustained winds in the state reached only 21 mph (34 km/h) in Jacksonville. At the same location, a trace of rainfall was also reported. Conditions were even lesser in St. Augustine, though wind gusts were slightly higher than in Jacksonville. To the north in Georgia, minor storm surge was reported, with the highest measured as 1.4 feet (0.43 m) above normal in Fort Pulaski. Sustained winds of 58 mph (93 km/h) was reported at The Tybee Island Light House, and this was the only record of tropical storm force winds in Georgia. Near tropical storm force winds were measured at the Savannah/Hilton Head International Airport, along with 6.1 inches (150 mm) of rain. High winds in Brunswick downed five trees, one of which struck a house. Additionally, winds felled at least 50 trees in the Savannah area, and two homes were struck. Scattered downed tree limbs were also reported in Hinesville and Bryan County, though no damage occurred. Because it was a Category 4 hurricane at landfall, the storm brought strong winds to many areas of South Carolina. In Downtown Charleston, sustained winds of 87 mph (140 km/h) were reported, along with gusts of 108 mph (174 km/h). The local National Weather Service office at Charleston International Airport recorded sustained winds of 78 mph (126 km/h) and gusts up to 97 mph (156 km/h). In Folly Beach, sustained winds of 85 mph (137 km/h) and a gust of 107 mph (172 km/h) were reported. The strongest wind gust of 120 mph (190 km/h) was recorded by the Snow Goose, which was anchored along the Sampit River near Georgetown. Extensive property damage was reported in several counties, especially in the South Carolina Lowcountry and the Grand Strand. More than 227,800 residences experienced power outages, and 85% of Bamberg and Orangeburg Counties were left without electricity, while Marion County became completely void of electrical services. Extensive losses reaching $1 billion were reported at Francis Marion National Forest where about 8,800 square miles (23,000 km2) of trees were downed, enough timber to build 660,000 homes. Storm surge and rough tides also caused extensive damage, especially in Charleston County. The highest storm surge observation was 20.2 feet (6.2 m) at Seewee Bay near McClellanville. Prior to the storm, residents of McClellanville took shelter in the cafeteria at Lincoln High School. However, storm surge flooded the room, with some people climbing up to the rafters for safety. A portion of the Ben Sawyer Bridge – linking Mount Pleasant to Sullivan's Island – collapsed due to strong winds and storm surge. On Sullivan's Island, water destroyed two or three rows of beach houses in some areas. At Isle of Palms, boats harbored at the marina were washed ashore and piled into a large heap. Losses at Sullivan's Island and Isle of Palms reached nearly $270 million. Rainfall was moderate, due to the storm's fast motion, peaking at 10.28 in (261 mm) at Edisto Island. No widespread flooding was reported, though a combination of rain and strong winds resulted in significant agriculture losses. The Red Cross estimates that 3,307 single family homes were destroyed, 18,171 were inflicted major damage, and 56,580 sustained minor impact. Additionally, more than 12,600 mobile homes and 18,000 multi-family houses were either damaged or destroyed. Damage from Hurricane Hugo in South Carolina was estimated at $5.9 billion. Hugo remains the strongest and costliest hurricane in the history of the state. There were 35 deaths, two from asphyxiation, four from collapsing houses, two from falling trees, nine from fire and smoke inhalation, six from drowning, four from electrocutions, six from heart attacks, one fatal accidental self–injury during clean–up, and one from unknown cause. North Carolina's coastline suffered significant damage along its southward-facing beaches, including Brunswick County and the Outer Banks. The storm reached Charlotte at 3 AM, only six hours after landfall, not having slowed down when reaching land. By this time, it was still a fairly strong tropical storm with sustained winds of 54 mph (87 km/h) and gusts of 87 mph (140 km/h). This was enough to topple trees across roads and houses, leaving many without power, closing schools for as long as two weeks, and spawning several tornadoes. Charlotte is roughly 150 miles (240 km) inland, and many coastal residents from both Carolinas went there to wait out the storm. By 7:00 am, it was still strong enough to cause heavy rain and tear down hundreds of trees in Conover. Damages in that state alone estimated at $1 billion (1989 USD, $1.91 billion 2016 USD). The ocean liner Queen Elizabeth 2 which had sailed from Southampton on September 17 encountered the hurricane and was delayed for two extra days at sea, having initially attempted to sail at full speed south to outrun the storm and cross the Atlantic, behind it, to New York. The ship had much damage to the public parts of the vessel, including the shops and the bridge; the swimming pools were all emptied to prevent large amounts of water shifting precariously as the ship pitched and tossed. Hugo moved quickly through western Virginia, West Virginia, and eastern Ohio to Erie, Pennsylvania. By the evening of September 22, it became an extratropical cyclone. Hugo caused schools in southwest Virginia to be closed for more than two weeks because of the wind and flooding damage. Winds peaked at 37 mph (60 km/h) at Ronald Reagan Washington National Airport. In New York, downed power lines due to strong winds left nearly 85,000 homes and businesses on Long Island without electricity. In the central portions of the state, winds downed several trees. The last death in relation to Hurricane Hugo occurred near Buffalo when the winds toppled a tree onto a motorist. The storm then moved northeastward across eastern Canada into the far North Atlantic Ocean. In Connecticut, wind gusts associated with the remnants of Hugo peaked at 49 mph (79 km/h) in Bridgeport. The winds caused minor property damage, while falling trees and tree limbs briefly left up to 30,000 customers without electricity. Gusty winds in Massachusetts left several thousand people without power, while also toppling trees and tree limbs, which caused minor damage to houses and cars. Additionally, apple orchards were impacted, with some losing up to their 30% of their crops. Strong winds throughout the state of Vermont downed power lines, trees, and tree limbs. Some boats on Lake Champlain were torn from their moorings due to swells up to several feet in height. In Rhode Island, the outer fringes of the remnants of Hugo produced wind gusts between 40 and 50 mph (64 and 80 km/h), causing minor property damage and scattered power outages. After becoming extratropical, the remnants of Hugo entered Canada into the province of Ontario. In the Niagara Falls area, winds between 37 and 43 mph (60 and 70 km/h) were reported. Winds near 47 mph (75 km/h) were also reported in Toronto. Heavy rainfall also occurred in Ontario, with precipitation in Ontario peaking at 4.5 in (110 mm), while a maximum amount of 1.85 in (47 mm) was reported in Toronto. As a result of the storm, blackouts and car accidents were reported in Toronto. Furthermore, heavy rains and high winds also occurred across the southern portions of Ontario. The remnants of Hugo tracked northeastward and entered the Canadian province of Quebec. In Montreal, rainfall reached only 0.43 in (11 mm), while precipitation amounts in the province peaked at 3.73 in (95 mm). In addition to light rain, high winds were reported in the province. Winds in Montreal gusted up to 59 mph (95 km/h), leaving 13,400 homes without electricity. 7,400 residence in Verdun and West Island also lost electricity when tree fell on power lines; it was restored about 12 hours later. While in Brossard and Chambly power was lost to 5,000 homes and 1,000 homes in Valleyfield. In addition, high winds and heavy rainfall also occurred in the St. Lawrence River Valley. Similar effects were reported in New Brunswick, though little rainfall occurred in the province. Winds gusting to 77 mph (124 km/h) was reported in Moncton. As a result of high winds, power poles were toppled and tree branches fell, which caused most of New Brunswick's 15,000 power failures. In addition, several tree and signs were blown over in Saint John and Moncton. The storm also significantly affected the apple crop in New Brunswick. Strong winds were also reported in Newfoundland, with gusts recorded up to 43 mph (69 km/h). Extensive relief aid was provided throughout by the Salvation Army, the Red Cross, and various churches. On the island of Saint Croix, looting and lawlessness reigned in the aftermath of Hugo. In Operation Hawkeye, then-President of the United States George H. W. Bush ordered federal forces to Saint Croix to suppress the violence, protect property, and restore law and order. Elements of the Army, Navy and the Coast Guard, along with a contingent from the U.S. Marshals Service and the Federal Bureau of Investigation (FBI), formed Joint Task Force (JTF) 40 for Operation Hawkeye. It also resulted in the first operational deployment of the National Disaster Medical System (NDMS), when the New Mexico-1 Disaster Medical Assistance Team (DMAT) was deployed to assist in medical care needs of the stricken island. Three days after the storm hit, the Governor of the United States Virgin Islands Alexander Farrelly asked President Bush for federal assistance in restoring order to the island. National Basketball Association player Tim Duncan, born in Christiansted and a two-time NBA MVP, of the San Antonio Spurs attributed his basketball career to Hurricane Hugo's destruction. When Tim was 13 years old he was a competitive swimmer who was considered one of the top United States competitors for the 400-meter freestyle. However, in the aftermath of Hugo, every swimming pool on Saint Croix was destroyed, including the Olympic-size swimming pool. With no pool to practice in, Duncan turned to basketball. Tim Duncan said, "I'm very fortunate to be where I am today. Without Hugo, I might still be swimming." A resident of St. Croix recorded the hurricane and aftermath on a VHS video camera. 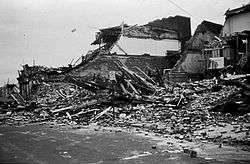 After being evacuated from the island days later, the video footage was aired on WGAL channel 8 from Lancaster, Pennsylvania, and picked up by NBC and aired as part of the nightly news. This was credited as the first "official" eye witness footage shown on U.S. national television. About 20 years later, Weather Underground member Jeff Masters wrote and described his experience on Saint Croix during the hurricane, noting that "in some respects, after 20 years, there are many aspects of the society that have yet to recover". After the storm, Governor Carroll Campbell said that the storm destroyed enough timber in South Carolina to "frame a home for every family in the state of West Virginia". An immense salvage effort was undertaken to harvest downed pine trees for pulpwood before they deteriorated to the point where they could not be used. Still standing timber that appeared usable for lumber and plywood frequently had annular separations of the rings that made them dangerous to saw and nearly impossible to cut into plies, so they were also downgraded into pulpwood, leading to such a drop in pulpwood prices that eventually much of the salvage effort ceased. In South Carolina, which bore the brunt of the storm, the Federal Emergency Management Agency (FEMA) was slow in responding. United States Senator from South Carolina Fritz Hollings referred to the agency as "a bunch of bureaucratic jackasses" during a speech on the floor of the United States Senate. An investigation was launched, which led to some reforms in FEMA procedures that helped the agency do a somewhat better job during Hurricane Andrew, the next catastrophic hurricane to strike the United States. However, FEMA was criticized severely in 2005 for its similarly insufficient response to Hurricane Katrina. Due to the extensive damage, the name Hugo was retired following this storm, and will never again be used for an Atlantic hurricane. It was replaced with Humberto in the 1995 season. 1 2 3 4 5 Lawrence, Miles (November 15, 1989). Preliminary Report: Hurricane Hugo (PDF) (Report). National Hurricane Center. pp. 1–2, 7. Retrieved August 26, 2012. 1 2 3 Landsea, Christopher (2004). "Costliest U.S. Hurricanes 1900–2004 (unadjusted)". National Hurricane Center. Retrieved January 26, 2010. ↑ Blake, Eric; Landsea, Christopher; Gibney, Ethan (August 2011). The Deadliest, Costliest, and Most Intense United States Tropical Cyclones from 1851 to 2010 (and Other Frequently Requested Hurricane Facts) (PDF) (Report). National Hurricane Center. p. 11. Retrieved August 26, 2012. ↑ Smith, Bruce (September 23, 1989). "Ravenel one who ignored the warning, staying home" (PDF). The Times and Democrat. Archived from the original (PDF) on January 3, 2010. Retrieved January 26, 2010. 1 2 Grammatico, Michael (April 2006). "Hurricane Hugo – September 22, 1989". Retrieved January 26, 2010. ↑ Beven, Jack (April 22, 1997). 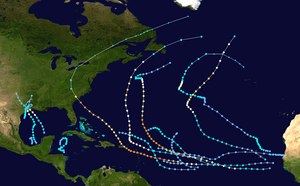 "The Deadliest Atlantic Tropical Cyclones, 1492–1996". National Hurricane Center. Retrieved January 26, 2010. ↑ Montserrat Hurricane – Sept 1989 (Report). International Rescue Corps. May 16, 2012. Retrieved March 23, 2013. ↑ United Kingdom – Montserrat (Report). Commonwealth Secretariat. 2009. Retrieved March 23, 2013. 1 2 3 Michael York (September 19, 1989). "Deadly Hugo Slams Puerto Rico, Virgin Islands". Washington Post. Retrieved May 3, 2010. ↑ Scott Pedersen (2000). Blown in, Blown off, and Blown up: the Bats of Montserrat, BWI (Report). University of Washington. Retrieved May 3, 2010. ↑ Masters, Jeffery. "Remembering Hurricane Hugo (Day 10)". Weather Underground. Retrieved December 19, 2010. ↑ Eric S. Blake; Ethan Gibney (August 2011). The Deadliest, Costliest, And Most Intense United States Tropical Cyclones From 1851 To 2010 (And Other Frequently Requested Hurricane Facts) (PDF). National Hurricane Center (Report). Miami, Florida: National Oceanic and Atmospheric Administration. p. 9. Retrieved March 22, 2013. 1 2 Claire B. Rubin; Roy Popkin (January 1990). Disaster Recovery After Hurricane Hugo In South Carolina (PDF). George Washington University (Report). Boulder, Colorado: University of Colorado. pp. 3–4. Retrieved March 22, 2013. 1 2 J.M. Watson (September 15, 1997). Coastal Conflicts (Report). Reston, Virginia: United States Geological Survey. Retrieved March 25, 2013. 1 2 3 4 5 6 Jay Hollifield; S.C. Lackey. Storm Data and Unusual Weather Phenomena: September 1989 (PDF). National Climatic Data Center (Report). Asheville, North Carolina: National Oceanic and Atmospheric Administration. pp. 46–49. Retrieved March 22, 2013. 1 2 "Hurricane Hugo". National Oceanic and Atmospheric Administration. July 30, 2009. Retrieved December 19, 2010. ↑ J. M. Saveland; D. D. Wade (1991). Fire Management Ramifications Of Hurricane Hugo (PDF) (Report). Branch, Georgia: United States Forest Service. p. 1. Retrieved March 22, 2013. ↑ David M. Roth (July 28, 2008). Hurricane Hugo – September 17–24, 1989 (Report). College Park, Maryland: Weather Prediction Center. Retrieved March 22, 2013. ↑ South Carolina Hurricane Climatology (Report). Columbia, South Carolina: South Carolina State Climatology Office. Retrieved March 22, 2013. ↑ McClain, Kathleen (September 23, 1989). "For City, a Turn for the Worse". The Charlotte Observer. ↑ "Hurricane Hugo". Michigan Technological University. Archived from the original on June 11, 2010. Retrieved December 19, 2010. ↑ David M. Roth (March 1, 2007). "Virginia Hurricane History: Late Twentieth Century". Hydrometeorological Prediction Center. Retrieved March 18, 2010. ↑ Masters, Jeffery. "Remembering Hurricane Hugo (Day 14)". Weather Underground. Retrieved March 25, 2011. 1 2 3 "1989-Hugo". Environment Canada. September 14, 2009. Retrieved August 16, 2011. ↑ "Disaster deployments by the NM1-DMAT". University of New Mexico. Retrieved December 19, 2010. ↑ "Tim Duncan biography". JockBios. Retrieved December 19, 2010. ↑ Noah, Mickey (August 26, 2009). "Hugo, 20 years ago, was disaster relief catalyst". Baptist Press. Retrieved August 23, 2011. ↑ Washburn, Gary. "Daley 'shocked' at federal snub of offers to help." Chicago Tribune. September 2, 2005. Retrieved on July 15, 2006. ↑ National Hurricane Center (2011). "Retired Hurricane Names Since 1954". National Oceanic and Atmospheric Administration. Retrieved March 27, 2011. ↑ The Daily Gleaner (June 1, 1991). "The changing faces of a cyclone". Archived from the original on January 7, 2016. Retrieved January 3, 2009. Scatena, F. N.; Larsen, M. C. (1991). "Physical Aspects of Hurricane Hugo in Puerto Rico". Biotropica. 23 (4): 317–323. doi:10.2307/2388247. JSTOR 2388247.